© 2013 by Meghan Belnap; all rights reserved; content may not be copied, rewritten, or republished without written permission. While owning a home is a great path to wealth and financial freedom, it comes with a few serious drawbacks. Some of these can cost a homeowner plenty of cash; here are the top five that homeowners face and how they can prevent them in the first place. Whether a family lives in Southern California or Colorado, they will face the threat of fire. This is also true for residents in other areas as house fires often start in the kitchen. To prevent problems in the first place, a homeowner should trim brush and other vegetation in the yard. In the house, residents should have easy access to fire extinguishers. While automatic sprinkler systems may be unusual in a residential setting, installing one may reap savings on your homeowners insurance premiums. Whether a person lives in a rainy area or not, they will have to take steps to prevent flooding. The easiest way to do this is to build a house on a high spot and keep the yard clean. This way, during torrential downpours, the water will not end up in the house. 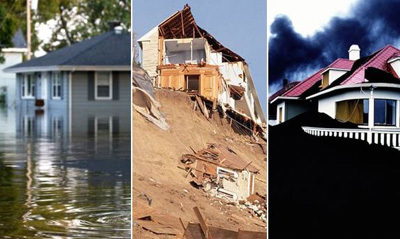 Flood insurance is a bargain at the price, and while always a good idea, it is critical if you live in the flood plain. In most areas of the world, you will have to occasionally deal with extreme wind. By itself this is usually not a serious problem. However, when windy conditions are compounded with nearby trees, they can fall on houses and cause extreme damage. A smart homeowner should trim nearby branches to avoid this expensive problem. If you dont feel comfortable approaching this task yourself, use a reference such as Angies List to find the right landscaper . An older house with plenty of wood framing and siding is often a cesspool for termites and insects like carpenter ants. This problem is not a fun one to deal with and will likely cost thousands of dollars to fix. Now, this is something that the average individual cannot fix without the help of a professional due to the toxic nature of the chemicals needed for a complete pest infestaion. Try Angie's List for reviews in your area. . However, when looking for a company that specializes in termite control, one can see the problem fixed quickly as professionals will do the job right the first time. For best results, depend on preventive measures. Mudslides are an often overlooked problem that some homeowners face and can be a serious and dangerous predicament. In areas with heavy and short burst of rain, people will have to deal with dangerous mudslides. Now, it is nearly impossible to prevent this from occurring. Fortunately, with well-placed sand bags and pieces of board, residents can protect the house and avoid seeing their possessions caked in mud and water. A homeowner should understand the risks and problems with owning a home in their specific location. Luckily, with a proactive approach and a long-term plan, residents can mostly avoid serious problems and save money in the process. Without a doubt, one can take steps to avoid damage and protect residents to the fullest. Do you have any tips that would benefit our readers regarding this topic? Please share in the comment section below!